Called a “starshade,” the huge, sunflower-like spacecraft would deploy to its full size in space, blocking the light of distant stars so that a space-based telescope can image exoplanets in orbit around the stars. With this technology, researchers could directly image other worlds and potentially find long sought-after Earth twins, a historically difficult task for alien planet hunters. 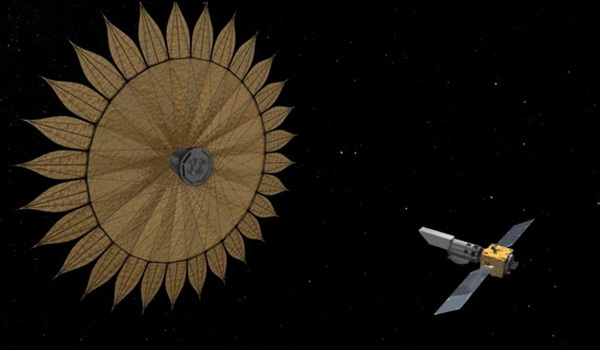 A sunflower-shaped ‘starshade’ launched to space with a simple telescope could help scientists on the ground hunt for another Earth. One major advantage to the starshade is that astronomers won’t need to couple it with a large, extremely expensive space telescope. By blocking out the light of a star before that light ever reaches the telescope, the starshade eliminates the need for a huge telescope, Seager said. A protytpe “petal” for a giant starshade being studied by NASA for a future planet-hunting mission. The petals would unfold in space to block the light of distant stars so an accompanying telescope can attempt to directly image alien planets. But it’s also still very difficult to create a large telescope with the internal machinery used to correct for starlight, Seager added. The starshade itself needs to be designed with extreme accuracy so that it can block light effectively once in space. Researchers on the ground at Princeton University in New Jersey and NASA’s Jet Propulsion Laboratory in California are working to test models of the starshade now. “Our current task is figuring out how to unfurl the starshade in space so that all the petals end up in the right place, with millimeter accuracy,” Princeton professor Jeremy Kasdin, the principal investigator of the starshade project, said in a statement. Once in space, the starshade unfolds and is positioned between the star and the telescope. The shade’s unique shape blocks the starlight, potentially revealing exoplanets in orbit around the star that couldn’t have been seen previously. With the light blocked, a telescope can directly image the planets. Astronomers have confirmed more than 800 planets beyond our own solar system, and the discoveries keep rolling in. How much do you know about these exotic worlds? NASA’s Kepler mission hunted for exoplanets until it suffered a critical failure last year. Unlike a starshade, Kepler used the transit method, recording small dips in a star’s light as a planet passed in front of it, to find other worlds. The Transiting Exoplanet Survey Satellite (TESS), scheduled for launch in 2017, also uses the transit method to find exoplanets, and this mission is expected to target other stars in a wider swath of sky. TESS probably won’t find Earth twins, but it will be able to see rocky planets around stars that are smaller than the sun, Seager said.